YOGI BEAR Trailer, Poster, Banners! Warner Bros. has just unveiled the teaser trailer of its live-action/CG animated adventure in 3D, “Yogi Bear”! This new adaptation of Hanna-Barbera’s classic cartoon will star Academy Award® nominee Dan Aykroyd (“Driving Miss Daisy”) as the voice of Jellystone Park’s most famous troublemaker, Yogi Bear. Two-time Emmy Award winner (“Saturday Night Live”) and six-time Grammy Award winner Justin Timberlake, previously starring as Artie in “Shrek the Third,” will star as the voice of Boo Boo, Yogi’s faithful pal and co-conspirator in his tireless schemes to separate Jellystone Park patrons from their lunches. In the film, Jellystone Park has been losing business, so Mayor Brown has decided to shut it down and sell the land. That means families will no longer be able to experience the natural beauty of the outdoors—and, even worse, Yogi and his pal Boo Boo will be tossed out of the only home they’ve ever known. 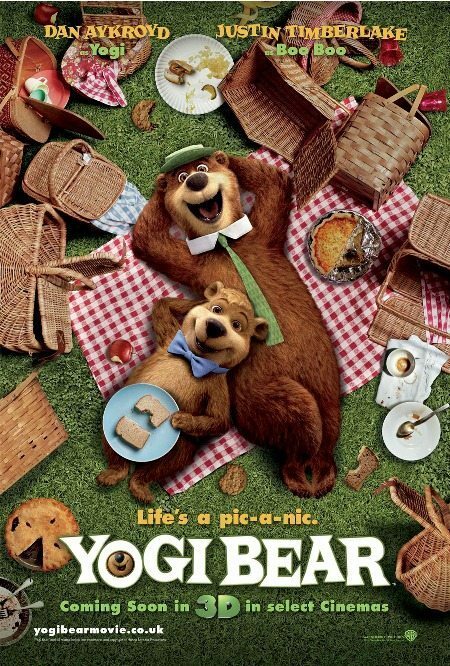 Faced with his biggest challenge ever, Yogi must prove that he really is “smarter than the average bear” as he and Boo Boo join forces with Ranger Smith to find a way to save the park from closing forever. Opening soon across the Philippines, “Yogi Bear” is distributed by Warner Bros. Pictures, a Warner Bros. Entertainment Company. Previous Post: « Gin Blossoms Playing the Philippines in November 2010!